In the game settings, the Combat Cues section is now added, which allows you to customize colors for various in-game combat indicators. This parameter will be especially useful for players who have problems with defining colors in the game. Now you can control the combat indicators as you see fit, including colors and brightness, both for friendly and enemy indicators. To set up combat indicators go to "Settings", then select "Gameplay" and find "Combat Cues" and "Custom Colors Indicators" in the "Combat" section. If you are an active PvP player, or an experienced craft, you can now store Alliance Points or Writ Vouchers in your bank. This means that you can now transfer AP and Writ Voucher to your other characters on the account. To transfer these things, visit the banker and use the "Deposit Currency" option. Note that you can only transfer the currency itself, your Alliance Rank or Alliance War Skill Lines does not apply to all characters. When you want to withdraw Alliance Points or Writ Vouchers from a bank account, just use the "Withdraw Currency" option, as if you were getting gold or Tel Var Stones. Developers have slightly improved the guild management by adding a feature to the guild invite history. This allows the heads and other members of the guild to check who in their guild invited someone to help the leaders better manage their (often very large) lists. To see the history of the invitations, open the Guild menu and go to History. 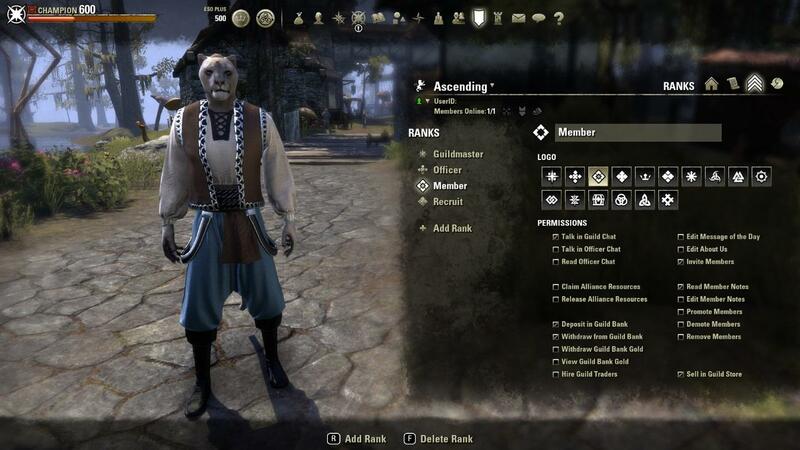 A new access setting has been added to the Guild ranking system, which will allow the guild leader to configure whether the Guildmasters can view the current bank accounts of his guild. This will allow them to keep the guild budget secret or open, depending on the adopted policy. The developers know that this feature was widely in demand in the trade guilds, so they are glad that they finally were able to realize this opportunity. The heads of guilds can check for permission to View Guild Bank Gold in the Ranks menu. Have you ever come across a situation where you would like to cancel one study in order to launch another, more important for you? Now it's possible! Cancellation of the study now allows you to immediately cancel any ongoing research. Note that if you cancel the research, the item that was destroyed in order to start the process will not be restored to you, so choose wisely! 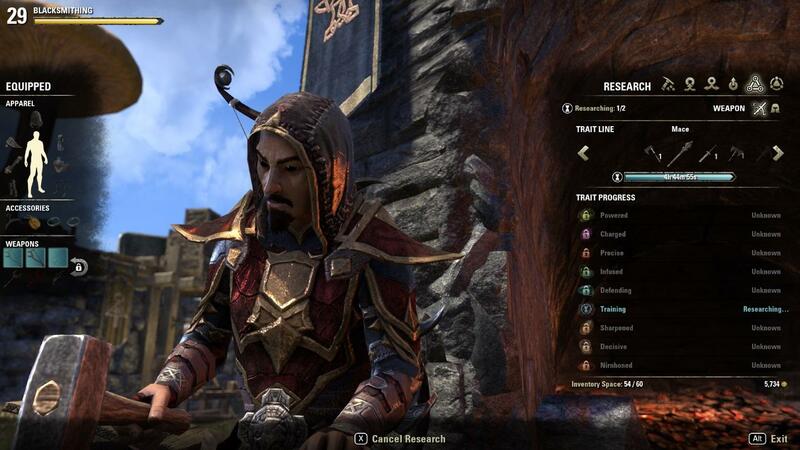 To cancel a particular current study, use the Crafting Station and go to the Research menu, find what you want to cancel and select Cancel Research, and then confirm your decision. Immediately after this you will be able to start another Trait. You no longer have to be naked to improve your equipment. With Update 15, you can now improve any items, even if they are worn by your hero. In the PC client, the equipment will be ticked in the lists for "Improvement", and on consoles such items will be listed in the subgroup "Equipped". 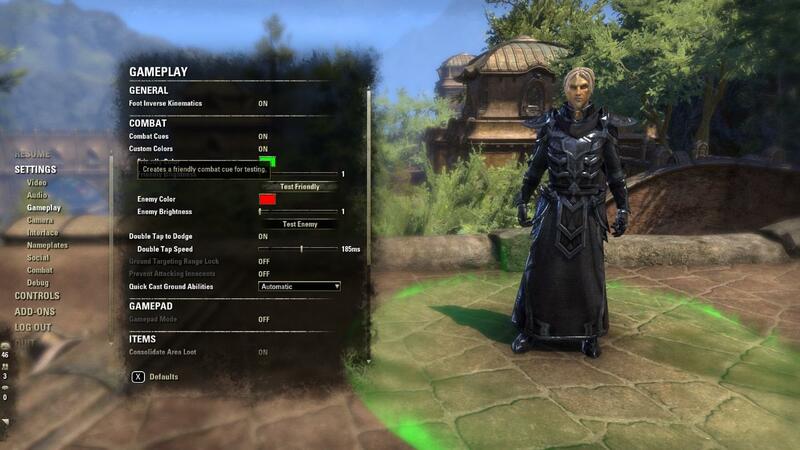 Also, a easy way for you to gain ESO money fast is to buy cheap ESO gold on ESO-GOLD. If you want to buy cheapest gold or power leveling, just make sure to spare some time to join in our site.